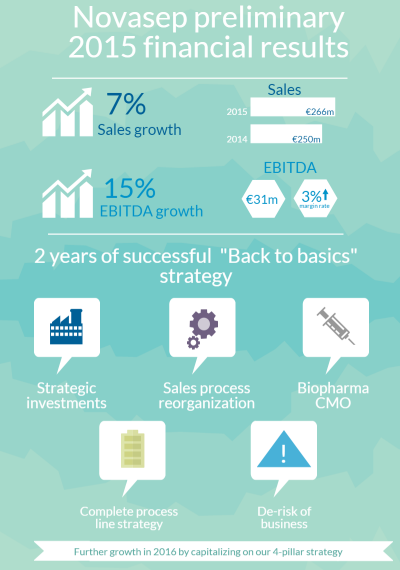 Lyon Gerland, France, March 2, 2016 - Novasep, a leading supplier of manufacturing solutions for the life science industries, has presented a successful second year of its ‘backs to basics’ strategy and provided preliminary financial results for the year ending December 31, 2015. 3% increase in EBITDA margin rate (8.5% to 11.5%). For the current year 2016, thanks to its robust backlog, Novasep anticipates further revenue growth in Synthesis, a continuation of the strong revenue level achieved by Biopharma in 2015 and a rebound of Industrial Biotech revenue to historic levels. Looking ahead, Novasep will fuel further growth momentum by capitalizing on its four-pillar strategy: developing traditional markets, expanding in geographical areas featuring strong market dynamics, developing the technology portfolio and integrating a full range of services for each market. Novasep is a global provider of cost-effective and sustainable manufacturing solutions for life sciences molecules and fine chemicals. Novasep's unique offering includes process development services, purification equipment and turnkey processes, contract manufacturing services and complex active molecules to serve pharmaceutical, biopharmaceutical, fine chemical, food and functional ingredients as well as fermentation and chemical commodities industries. The unaudited preliminary financial information included in this press release has been prepared by management. This information is preliminary and is subject to change. During the course of our review process on this preliminary information, we could identify items that would require us to make adjustments and which could affect our final results of operations. This preliminary information may not be indicative of the results of any other period. Some of the statements in this document are forward-looking. Forward-looking statements include statements regarding the intent, belief and current expectations of the company or its officers with respect to various matters. When used in this document, the words "expects," "believes," "anticipates," "plans," "may," "will," "should" and similar expressions, and the negatives thereof, are intended to identify forward-looking statements. Such statements are not promises or guarantees, and are subject to risks and uncertainties that could cause actual outcomes to differ materially from those suggested by any such statements.